A strong storm offshore isn’t expected to bring rain to the Bay Area, but gusty winds associated with it are sending a long period swell to the Pacific Coast that may power up waves 25 feet and higher starting Thursday. A high surf advisory is active from 6 p.m. Thursday into Friday morning. Some breakers near Pillar Point in San Mateo County may reach higher than 25 feet at times as the west/northwest swell energy slows down approaching undersea ridges offshore. 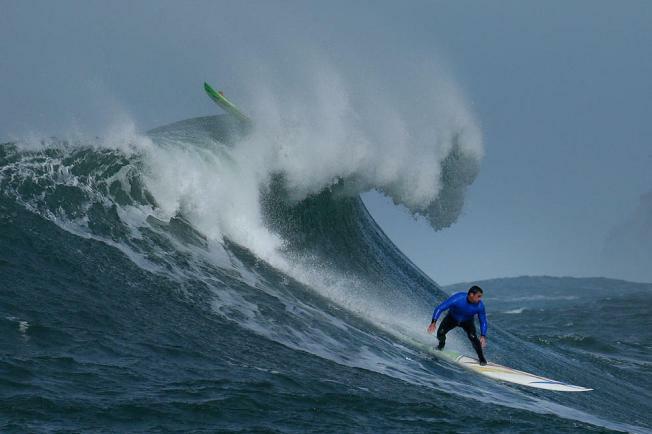 Those help vault energy upward, creating those classic tall arching waves Mavericks near Half Moon Bay is known for. Pacifica resident Yolanda Pranza says the action in the ocean is generating quite the buzz. "People totally enjoy the scenery around here," she said. "We are getting a lot of tourists coming out just to check out the waves." As temperatures climb through Friday beach goers are urged to use caution and rip currents will be unusually strong with the possibly of sneaker waves. Ria Tajbl from Pacifica understands the risks that come along with gazing at the spectacular scene. "It's still beautiful, but also dangerous so you have to watch out if you're on the shore," she said. Wave heights are expected to decline into the weekend.